SAINT PAUL (December 6th, 2018) – New construction is underway at the busy intersection of Rice Street and Como Avenue in St. Paul’s Thomas-Dale (Frogtown) neighborhood. 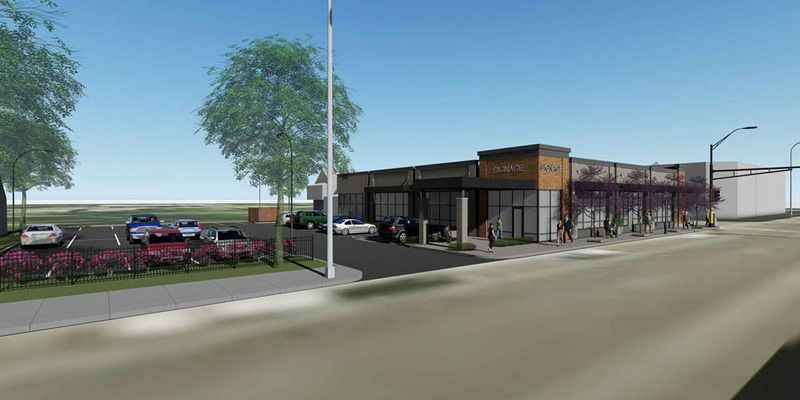 Commercial real estate developer MSP Commercial has teamed up with Fresenius Medical Care to build a single-story dialysis center on the vacant corner lot. The new facility is being constructed in the Capitol Area Architectural Overlay District, an area of focus for economic growth and reinvestment for the City of St. Paul. The city-designated zone runs along Rice Street, stretching from University Avenue to Pennsylvania Avenue. The project team started construction at the site in early November. Mission Construction was chosen as the general contractor. Mohagen Hansen Architecture|Interiors, Loucks Inc. and Innovative Structural Solutions have also joined the project team. MSP Commercial (owner, developer) will continue to oversee the construction process and will stay on as the property management firm once completed. A global dialysis and kidney care provider, Fresenius Medical Care has an established presence in the Twin Cities with over 25 locations throughout the seven-county metro area. The majority of the roughly 9,000 sq. ft building will be occupied by Fresenius, but a 750 sq. ft area has been set aside for a small retail tenant. The retail tenant has yet to be announced. The building will also have on-site surface parking on its north side for around 20 vehicles, in addition to street parking. Fresenius is scheduled to have their first patient day in August of 2019.